The 2014 crisis in Ukraine sent a tottering U.S.-Russian relationship over a cliff - a dangerous descent into deep mistrust, severed ties, and potential confrontation reminiscent of the Cold War period. In this incisive new analysis, leading expert on Soviet and Russian foreign policy, Robert Legvold, explores in detail this qualitatively new phase in a relationship that has alternated between hope and disappointment for much of the past two decades. Tracing the long and tortured path leading to this critical juncture, he contends that the recent deterioration of Russia-U.S. relations deserves to be understood as a return to cold war with great and lasting consequences. In drawing out the commonalities between the original cold war and the current confrontation, Return to Cold War brings a fresh perspective to what is happening between the two countries, its broader significance beyond the immediate issues of the day, and how political leaders in both countries might adjust their approaches in order, as the author urges, to make this new cold war "as short and shallow as possible." 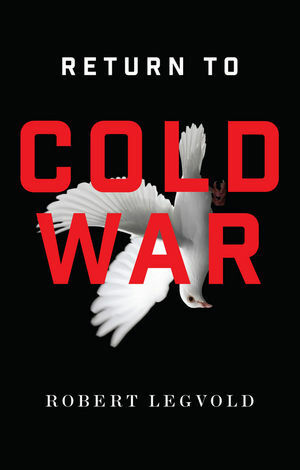 "Scholars and pundits have begun to ask if a new Cold War is emerging. Robert Legvold is among the most qualified people to answer this question and he has sought, carefully and objectively, to do so in his new book." "The relationship between the United States and Russia is the worst it has been since the early 1980s. Legvold recognizes that there is a long road back to any sort of quality engagement between the two countries, but a great place to start turning things around is for policymakers on both sides to read this book." "The author's presentation is succinct, lucid, fairly dispassionate and almost incessantly even-handed. I got the sense that he wrote it as if addressing an assembly of the policy-making elites of both sides, pointing out the confluence of blunders and rationalizations that worsened steadily to create a situation that, if not necessarily irreversible, now looks likely to continue in the same direction for some time to come." "Return to Cold War presents comprehensive analysis and penetrating insights into the current crisis in relations between Russia and the West. It is a 'must-read' for anyone seeking to understand what has happened to this relationship and why. Most importantly, Legvold shares his ideas on how the two countries – with wise political leadership – can make the return to the Cold War short and shallow." "Robert Legvold, one of the world's leading authorities on Soviet and Russian foreign policy, paints a sombre picture of the dangerous state of US–Russian relations, but he also has constructive ideas on the way out of the current impasse which policymakers would do well to heed." "Robert Legvold is one of the most thoughtful students of U.S.-Russian relations, from the period of the Cold War to the times of Russian-Western cooperation and even attempts at integration to the current new confrontation which he calls cold war II. There is hardly anyone in the world who knows the subject better than Bob, or can explain it in such a rich and precise language, leading to very compelling arguments and conclusions. All those with a serious interest in how the West and Russia got where they are today, and what the future may hold out must read Professor Legvold's book. It reveals the past and illuminates the future"
"Legvold recognizes that there is a long road back to any sort of quality engagement between the two countries, but a great place to start turning things around is for policymakers on both sides to read this book."